Casa Feliz Studios is on the 600 block of 9th Street in SUN. It was built by First Community Housing, and replaced an old apartment building with no place for tenants to socialize other than the porch and sidewalk in front. The SUN Association had input into the design and landscape, and Sandra Soellner represented SUN on the Board of First Community Housing. It is a wonderful example of SUN working with developers to add housing that contributes to the ambiance of and quality of life for our neighborhood. First Community Housing was honored in November 2010 by having Casa Feliz Studios named “Best Rental Affordable Housing Project” by the Home Depot Foundation. As part of this process, the Home Depot Foundation created the 4.5 minute video below. 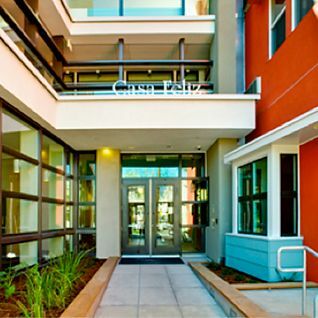 First Community Housing’s Casa Feliz Studios provides developmentally-disabled and low-income residents with a healthy, safe, affordable housing option in the heart of downtown. This beautiful 60-unit Single Room Occupancy (SRO) development meets the U.S Green Building Council’s LEED Gold standards and is a state-wide model for special needs housing. By incorporating energy-efficient design, solar panels, a green roof, and low-emissions materials, residents at Casa Feliz Studios see 25 percent energy savings and 36 percent water savings, yet greening the project added only 1 percent to the total development costs.